← Simpsons Comic Artist At All About Books & Comics! 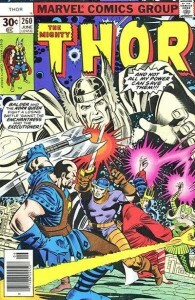 I have Marvel comics from the late ’70s thru the mid ’80s. There are variations in the top left symbols and UPC (when UPCs were introduced). In my youthful exuberance I had both a subscription (brown wrapped comic) and went to the news stand, so I have two of the same in a number of cases, with different top left corner and UPC (UPC or, say, Spidey face) that seems to be the diff possibly. Could you shed some light? Is there really any diff regarding pricing/collectibility? Well, Greg, there are actually a couple of things going on with cover variations: first, and earliest, in the mid-’70s Marvel test-marketed price increases (from 25 to 30 cents in 1976, and from 30 to 35 cents in 1977) in a few cities before instituting them nationwide, and so a couple of issues of the Marvel books have price variants; the rarer, “higher” prices go for about 2.5 times the “regular” prices. Those variants, though, apply only to the price; the rest of the cover, including the UPC box, remains the same. 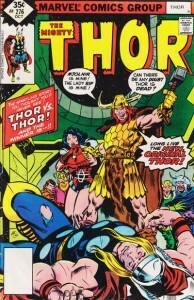 Another variant comes from the “Whitman three-packs”: the Whitman company, which distributed Gold Key comics (that’s an oversimplification of a tangled corporate relationship I’m not going to get into here), contracted with Marvel in the late ’70s to market bagged sets of Marvel comics in places like K-Mart. Those came three to a bag, and can be distinguished by an altered upper-left box and a blank UPC code. 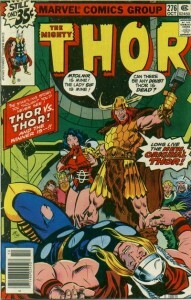 Note the picture here of two copies of Thor #275, from September 1978: one issue is the “normal” copy, and the other is the so-called “Whitman variant.” The Whitman variants, when out of the bag, are usually the same price as the “normal” books, although unopened three-packs can go for more — roughly twice what the three books inside the bag would go for in their “regular” incarnations. 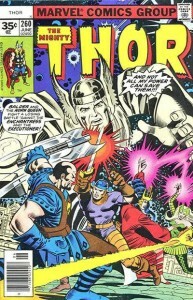 The biggest and most long-lived cover variant, though, came about because of the rise of comic book stores in the late ’70s. 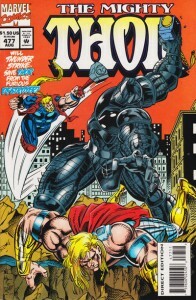 This “direct market” for comics developed a different wholesale arrangement with Marvel than the regular newsstand distributors did: the comic book stores got a bigger discount on the comics, but, unlike newsstand books, they weren’t “returnable”: owners couldn’t tear off the covers of unsold books and send them back in for credit. 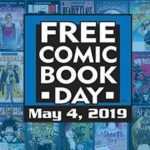 What sometimes happened, though, was that an unscrupulous comic store owner could sell his unsold books to a newsstand owner, who then could send the covers in for credit. To prevent this, Marvel, in the summer of 1979, starting putting slightly different covers on books sold to comic book stores. 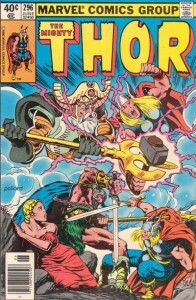 Look at Thor #285, from July 1979: the newsstand comic has the “regular” cover, while the comic book store issue has a slash through the UPC code, plus a partially-darkened upper-left price box. Copies of this cover were not returnable, while the “regular” covers were. 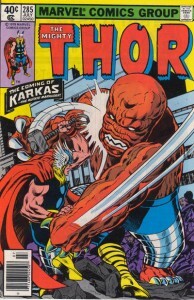 Over time, Marvel changed the ways the covers differed: by Thor #296 (June, 1980) the familiar Spidey logo appears in the comic store copies, while the newsstand copies have the UPC code. 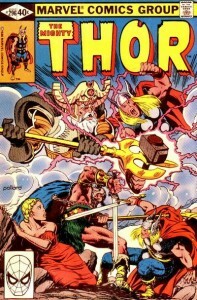 Other variations followed: for a while, each series had individualized icons (so Thor’s hammer was in the box on his books instead of the UPC code), and special issues sometimes played around with the box, too. Over time, however, as comics stores got bigger and wanted to track their inventory better, they wanted to be able to scan those UPC codes just like the newsstands. By the ’90s, Marvel had standardized the difference (and made it a lot more boring) by just using a “direct market” designation in the comic store copies, along with the same UPC code as in the newsstand variations. Is there any difference in price? The Overstreet Price Guide has never noted one (arguing that the insides are identical, both covers are printed at the same time, and the differences are minor); in the 23 years I’ve worked at AABC, only two collectors have ever indicated a preference: one wanted only newsstand copies of his ’70s and ’80s books, and the other wanted only the direct-market copies. 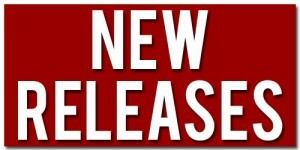 In terms of scarcity, at the beginning, in 1979, the direct market editions numbered a lot less than the newsstand copies, but by the ’90s that ratio had reversed: the direct market had practically taken over, and it was the newsstand books that were scarce; today, of course, those sales on most titles are almost nonexistent. AABC’s backstock tends to have a lot more of the direct copies (because that’s how we bought the books originally) than the newsstand ones (which have only come in through our buying collections from other people) — but, again, since no one seems to care, the prices have never been any different either. 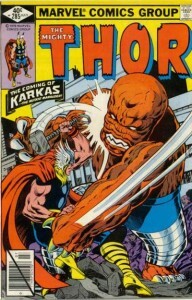 This entry was posted in Comics History, Marvel and tagged cover variations, direct market, price variants, Whitman. Bookmark the permalink. Thanks Phil, that was way more interesting to me than I thought it would be! Phil, thank you very much. I appreciate you taking the time to answer that. Thank you, fun and informative read. Didn’t know the ‘whys’ behind the differences.